I went to Talisman to bring Phoenix home, but Teddy and I connected and I went from zero to two Silkens in the blink of an eye. Teddy excels at field events and has amassed a trunk load of Silken Windhound firsts. Phoenix is a stay-at-home kind of girl and enjoys lounging with her head in your lap. 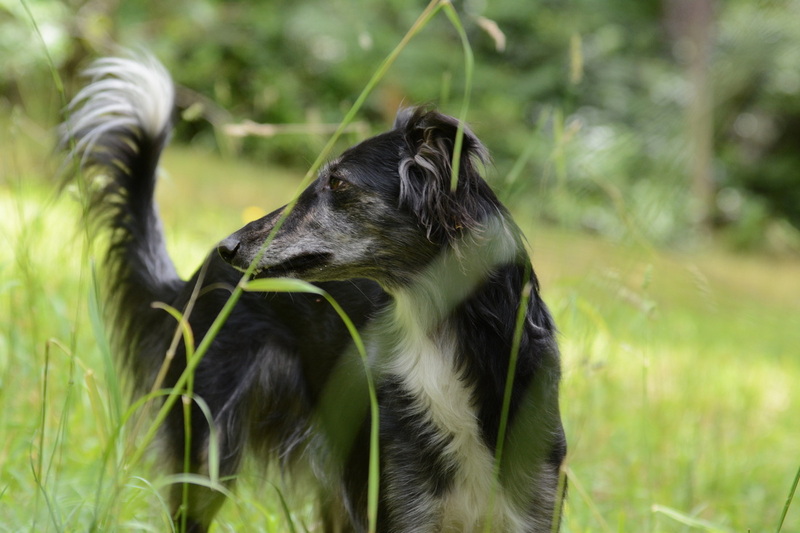 Phoenix is at home in Oregon with her Silken Windhound, Deerhound, Greyhound and Italian Greyhound friends. and is now enjoying her retirement from motherhood. Summer, our Silken Windhound dynamo, approaches life with great enthusiasm! She's small, fast and smart -- a devilishly good combination. night catching moths. In addition to showing, Gemma has graduated from race practices to race meets. Poppy has outgrown her early landscaping and woodworking hobbies. Now that she's older, she has decided to develop her interest in agility. Sasha keeps everyone busy with her games. Poppy and Gemma meet Samantha.